Beer editor JJ Bagley looks at how Sierra Nevada makes not only great beer, but great choices for the environment. Alan Kropf travels to the streets of Seattle to a bright blue building located on the corner of 9th and Thomas. Within this buildings he not only finds a plethora of soda and energy drinks, but also the passionate people behind the creations of these drinks. Alan Kropf takes a trip up a 600ft high elevator ride to find himself in, SkyCity at the Space Needle. While sitting in a rotating room Alan receives an inside look into how much effort and knowledge is behind the SkyCity food and beverage program. Energyology: What’s In This Stuff??? After filling his belly with 1000mg of Taurine, Jeff Dorenbush sits down and dives into the world of fine energy-drink to gain a better grasp of the supplements contained within. 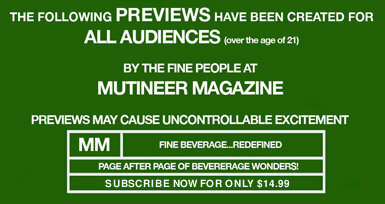 Haven’t subscribed yet to receive your copy of Mutineer? Subscribe here. looking forward to the Jones Soda article, I have had a couple and they rock! Can’t wait to see it … each issue gets better and better!